Cattle grazing in Bahia Blanca, Argentina. Credit: Milo Mitchell (IFPRI), 2014. It began with an innocent enquiry: do we have relative humidity data, under climate change for possible future situations, that could be used to think about a direct effect on animal productivity? Currently, in our economic modeling, the cattle, hogs, chickens, etc., are only indirectly affected by changes in feed/fodder prices when those are affected by climate change. But, we are not capturing any direct effect from hot animals. We would like to end up with global maps of some index that can tell us something about the stress that animals would experience under typical conditions at each place on the map. The problem, of course, is that the climate data we normally use for crop modeling do not include relative humidity. That is not quite right: some of the raw data do, but not in the data we have cleaned up and arranged for using in the crop models. In order to try to keep things internally consistent, we would like to build up a rough approximation based on what we do have. Read more on IFPRI's Climate Change blog. Conservation Agriculture has the potential to enhance soil fertility and reduce erosion across 260,000 hectares (ha) of fragile and degraded cereal land in Tunisia, according to a joint study by the country’s National Institute of Agronomic Research (INRAT) and ICARDA. A Zero Tillage seeder on fragile and degraded cereal land in North East Tunisia (Photo credit: INGC Tunisia). Conservation Agriculture (CA) – the practice of not plowing and leaving crop residue in fields for enhanced soil fertility and moisture conservation – was first introduced to Tunisia in 1999, where it was pilot-tested on 11 farms in the country’s North-East. While the area cultivated under CA has since grown, the practice is still applied on only 12,000 ha of agricultural land – an area distributed among 200 farmers and operated by some 102 seeders. Growth in agricultural productivity and expanding markets have made more food available to more people than ever before. The options available to the average consumer visiting a supermarket are richer and more varied than at any time in history. But this abundance comes at a cost to our health and the planet. REUTERS/Marcos Brindicci. Cows graze on a farm near Chascomus, Argentina. A new study shows that carbon taxes on carbon-intensive products such as beef could help slow climate change while boosting public health. Obesity, diabetes, and hypertension are increasing significantly across the world, particularly in middle- and high-income countries. Meanwhile, food production is a major contributor to climate change: agriculture (excluding land use change) accounts for 11 percent of global carbon emissions. To achieve the Paris climate agreement’s emission reduction targets and try to limit global temperature increases to 2 degrees Celsius by 2100, nations will have to deploy creative new policies to limit carbon emissions on both the supply and demand sides. A carbon tax on food, if done right, could help nations meet emission reduction targets while improving nutrition and public health. Researchers from IFPRI and the Oxford Martin School recently modeled the potential consequences and tradeoffs of levying carbon taxes on food. Read more on the IFPRI blog. Trends in population and income growth along with climate change pose significant risks to achieving sustainable food security. 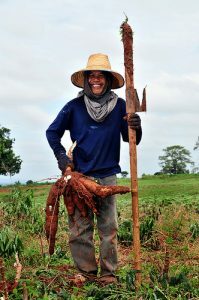 As challenges to the agricultural sector grow, we need improved tools to understand the risks, and to evaluate alternative solutions to mitigate some of these risks. In order for these tools to be useful, they need to capture the reality of a sector where farmers react to both biophysical changes in crop productivity, as well as to the economic impacts from the market they face. In a new paper titled “Structural Approaches to Modeling the Impact of Climate Change and Adaptation Technologies and Crop Yields and Food Security”, Islam et al. (2016) look at the “structural approach” (Figure 1). This is a modeling method that combines both biophysical and economic modeling in order to answer some of the questions related to how climate change may affect agricultural production and what role improved crop varieties may have to reduce some of the negative impacts. The authors found that adoption of drought and heat tolerant maize, wheat, potatoes, sorghum, and groundnut in select countries have the potential to reduce the negative impacts from climate change, even though the biophysical yield gains are dampened through market responses. Figure 1: Primary components of the structural approach used in research on climate impacts in agriculture and food systems. The work in this in paper was possible due to our long-term collaboration with partner centers across the CGIAR and the collaboration of a multi-disciplinary team through the Global Futures & Strategic Foresight (GFSF) program. The methodology enabled us to combine information from crops trials to parameterize alternative drought and heat tolerant technologies into crop models (in this case the DSSAT crop model). The link between crop models and the IMPACT economic model (Robinson et al., 2015) allowed us to take into consideration market effects, and therefore obtain a better estimate of production following adoption of these improved varieties, as well as estimate effects on world prices and trade. Global Futures and Strategic Foresight (GFSF) is a CGIAR initiative led by IFPRI and funded by the Bill and Melinda Gates Foundation, the CGIAR Research Program on Policies, Institutions and Markets (PIM), and the CGIAR Research Program on Climate Change, Agriculture and Food Security (CCAFS). Islam, S., Cenacchi, N., Sulser, T.B., Gbegbelegbe, S., Hareau, G., Kleinwechter, U., Mason-D'Croz, D., Nedumaran, S., Robertson, R., Robinson, S. and Wiebe, K., 2016. Structural approaches to modeling the impact of climate change and adaptation technologies on crop yields and food security. Global Food Security, 10, pp.63-70. Robinson, S., Mason-D’Croz, D., Islam, S., Cenacchi, N., Creamer, B., Gueneau, A., Hareau, G., Kleinwechter, U., Mottaleb, K., Nedumaran, S., Robertson, R., Rosegrant, M.W., Gbegbelegbe, S., Sulser, T.B., and Wiebe, K., 2015b. New Crop Varieties and Climate Change Adaptation: Ex-Ante Analysis of Promising and Alternative Technologies. IFPRI Discussion Paper Series, Washington, DC: International Food Policy Research Institute (IFPRI). When crops are damaged by other living organisms such as bacteria, viruses, fungi, insects and other pests, weeds or even cultivated plants competing for space and nutrients, we talk of the biotic stress. Biotic stresses are a major constraint to agricultural productivity in low and middle income countries. They affect poor producers and consumers the most and undermine food security in general. Examples of some biggest current concerns related to biotic stress are the wheat diseases fusarium head blight (FHB), wheat blast (caused by fungi), and the maize lethal necrosis (MLN) caused by viruses (also read here). Scientists in the International Maize and Wheat Improvement Center (CIMMYT) know all about biotic stresses to crops. They also know that combatting these stresses is a task beyond the scope of any one organization or discipline. This was evident during the workshop in Addis Ababa, Ethiopia, on June 20-22 that brought together breeders, physiologists, entomologists, pathologists, modelers, and socio-economists from CIMMYT and partner organizations including Auburn University, University of Passo Fundo, and the International Food Policy Research Institute (IFPRI). The workshop titled "How can we take biotic stress into consideration with crop growth modeling in maize and wheat?" was organized by CIMMYT as part of the Global Futures & Strategic Foresight (GFSF) project, a CGIAR initiative led by IFPRI under the CGIAR Research Program on Policies, Institutions, and Markets (PIM). Participants at the CIMMYT workshop. 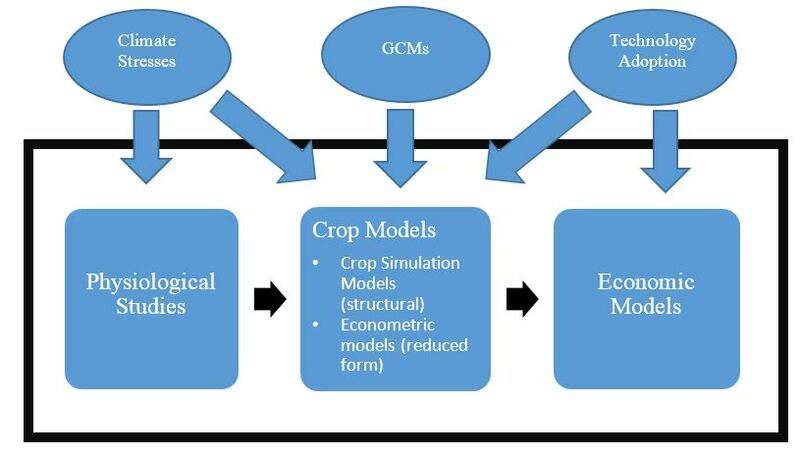 Crop growth (or simulation) models are computer programs processing data on weather, soil, and crop management to predict crop yield, maturity date, efficiency of fertilizers and other elements of crop production. Accuracy of the predictions is based on the existing knowledge of the physics, physiology and ecology of crop responses to the environment. So, the more we know about this responsiveness to the environment, including biotic stress, the more accurate these predictions can be. Existing crop growth models do not adequately simulate biotic stress to calculate possible yield reduction. Colleagues who came to Addis Ababa were eager to expand this knowledge and increase the accuracy of the predictions through integrating biotic stress and crop models. 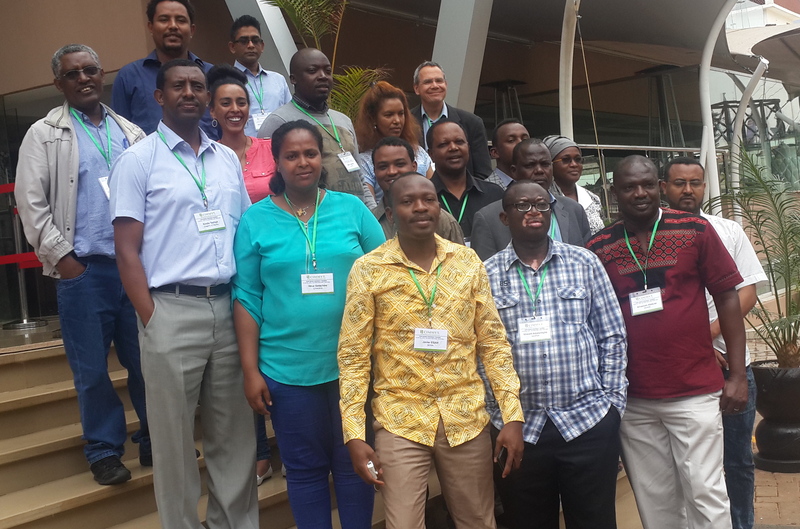 Dr. Gideon Kruseman, an ex-ante and foresight specialist at CIMMYT, and Dr. Bekele Abeyo, a wheat breeder and CIMMYT’s Ethiopia country representative, opened the workshop by reviewing the use of crop models in maize and wheat production systems. Dr. Kruseman explained the importance of integrating the models for biotic stress with crop models for a holistic assessment of the potential impact of new technologies in several environments. Dr. Abeyo emphasized the need for the partners to work together across disciplines. 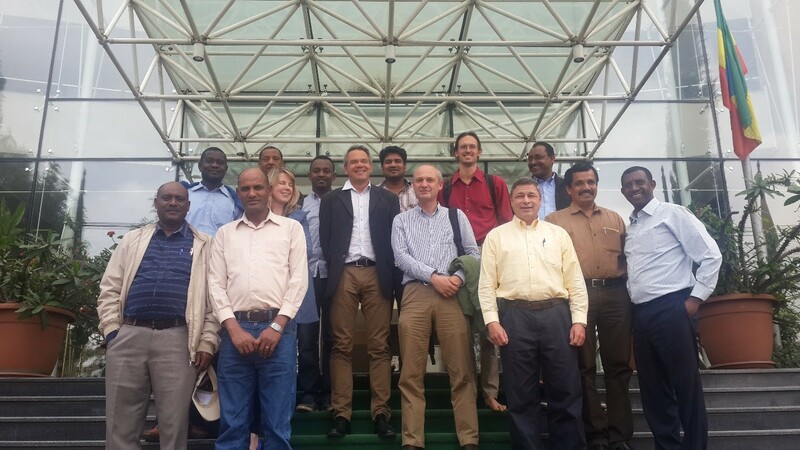 Workshop discussions were dedicated, among other topics, to CIMMYT’s experiences in applications of crop models (for example, see: Chung et al., 2014; Gbegbelegbe, Chung, Shiferaw, Msangi, & Tesfay, 2014; Tesfaye et al., 2015, 2016), opportunities and challenges of incorporating biotic stress directly into crop growth models, linking crop growth models with biotic stress models through soft coupling, phenotyping for biotic stresses, and the probabilistic approaches to linking biotic stress into crop growth models. 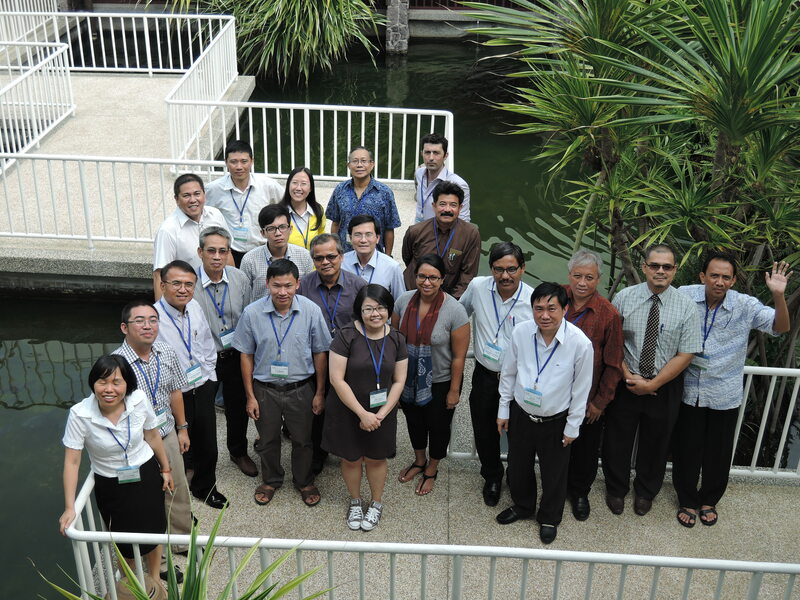 Apart from that, colleagues focused on the scale of biotic stress as a challenge, data gaps, and future action points, emphasizing the importance of collaboration with other initiatives such as AgMIP. Figure: Example of linkages among biophysical and economic models. 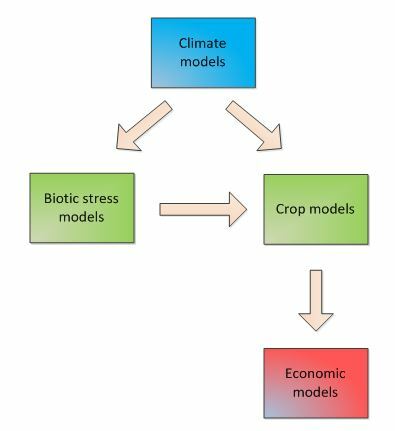 As a way forward, participants agreed that soft coupling biotic stress models with crop models is a feasible approach in the short- and mid-term perspective whereas full integration can remain a long-term strategy. The soft coupling efforts presented by colleagues from Auburn University, USA, and University of Passo Fundo, Brazil, should serve as a springboard to link the major maize and wheat biotic stresses with current crop models such as those comprised in the Decision Support System for Agrotechnology Transfer (DSSAT). Moreover, an approach that considers probability of disease incidence, probability of disease severity, and probability of damage can also offer scope for linking crop growth models and biotic stress either separately or in combination with soft coupled models. 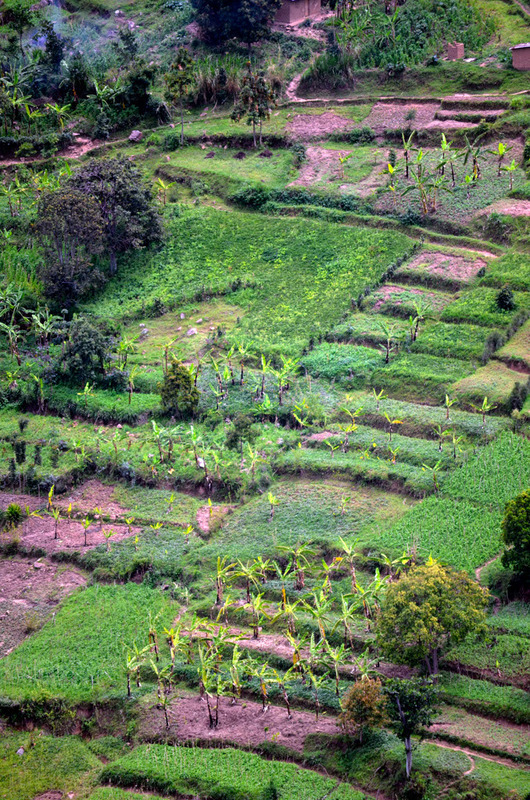 The probabilistic approach can be especially useful when linking crop growth models with economic models, for example, to see how the chance of a disease outbreak shapes the choices made by farmers. As a result of the workshop, partners agreed to start a small pilot project on integrating biotic stress with crop models to prove of concept. Concept notes shall be submitted to the competitive grant by the CGIAR Research Program on Maize. At the next stage partners shall come together to develop a bigger project and approach donors. “I really enjoyed the workshop because it brought together a very diverse range of scientists that I would never normally get to interact with. Modeling abiotic stresses allowed us to quantify the potential impacts of improved varieties at the regional and national level. I’m excited to be able to do this for biotic stresses” -- Jill Cairns, Maize physiologist at CIMMYT. Chung, U., Gbegbelegbe, S., Shiferaw, B., Robertson, R., Yun, J. I., Tesfaye, K., … Sonder, K. (2014). Modeling the effect of a heat wave on maize production in the USA and its implications on food security in the developing world. Weather and Climate Extremes, 5-6, 67–77. Tesfaye, K., Kai Sonder, Jill Cairns, Cosmos Magorokosho, Amsal Tarekegne, Girma T. Kassie, Fite Getaneh, Tahirou Abdoulaye, Tsedeke Abate, and Olaf Erenstein (2016). Targeting Drought-Tolerant Maize Varieties in Southern Africa: A Geospatial Crop Modeling Approach Using Big Data. International Food and Agribusiness Management Review, 9 (A): 75-92. Soft coupling refers to linking two separate models through an interface that allows information to be exchanged amongst them. Phenotyping for biotic stress refers to trials conducted specifically to obtain information on how varieties react to pests and diseases, by subjecting the trials to substantial levels of the specified stressors. How can we take biotic stress into consideration with crop growth modelling in maize and wheat? "How can we take biotic stress into consideration with crop growth modelling in maize and wheat?" Crop growth models have been and are being used as part of bio-economic modelling endeavors. One of the key aspects that has not been resolved is biotic stress as a yield reducing factor, despite the fact that biotic stress is a very important contributing factor to low yields in the target areas of CGIAR. Existing crop growth models that we use, do not adequately simulate biotic stress.